LW2 is close to being sold-out, a limited number of sets are available here. Use the following purchase securely (protected by PayPal). 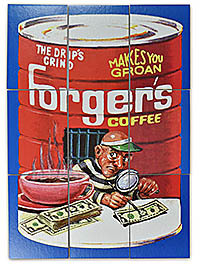 In 2008 a large number of lost wacky titles turned up in the Patrick Piggot collection. 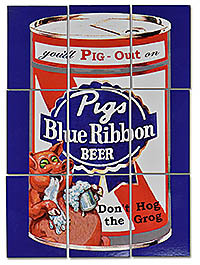 Piggot had been hired to paint the bulk of a proposed 2nd series in 1992, to follow the 1991 series. Many great titles were produced but ultimately the entire series was nixed. Collectors had seen many roughs but few finished titles for this series. 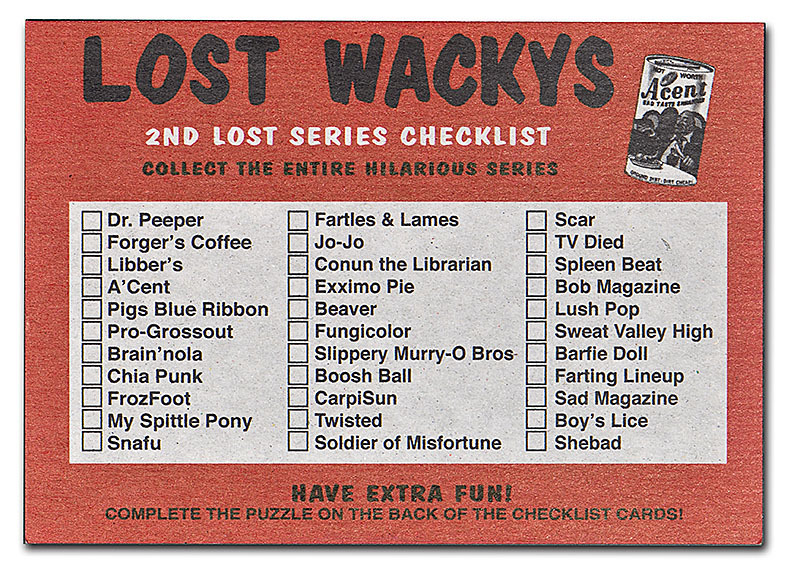 Therefore it was an amazing find and motivated the Lost Wacky conglomerate to put aside their differences and print an entire 2nd lost series. 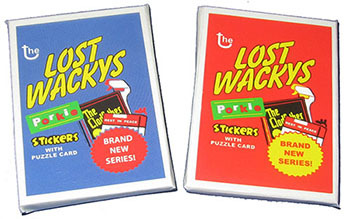 In addition collectors now had in their hands the original art for the classic Can Label series, the last Wackys ever painted by the master Norm Saunders. This was before anybody imagined Topps themselves would eventually release those titles in the Flashback Series. It was clear that there was nowhere near enough LW1 sets produced to meet demand, therefore a larger print run was done for LW2, somewhere around 400 sets should exist. 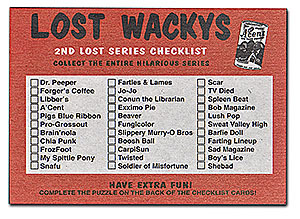 The main checklist puzzle was based on Forger's. 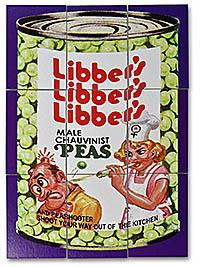 Three alternate puzzles were produced, Libber's, Dr. Peeper and Pigs. 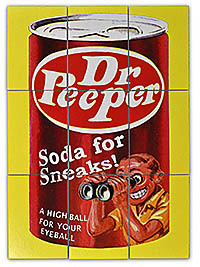 There are doubles, 30 horizontal and 28 vertical. There are 25 sets of Red Ludlows and 25 sets of Black Ludlows. 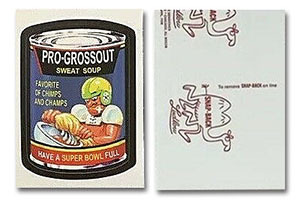 These sets were numbered 1 to 25 on the back of the wax packs. There are few sets of Black and Red Ludlow Doubles.